A glorious university town, Dunedin sprawls along the Otago Harbor and peninsular. Cast along the underside of New Zealand’s South Island, this dynamic location is a great place to visit for a taste of ‘old’ New Zealand. The city’s name in Gaelic is Dùn Èideann, which means ‘Edinburgh’, and visitors can pick up some of the city’s very own tartan to take home. Our selection of luxury hotels in Dunedin each have their own unique charm. You can choose between a sumptuous country house, a secluded eco-lodge or a stay in New Zealand’s only castle. Whatever you’re looking for, we’re confident that you won’t be disappointed. Dunedin is a city of galleries. Visit Dunedin Public Art Gallery to see some important works by the Old Masters, or perhaps Milford Galleries Dunedin which exhibits significant artists from New Zealand. For something more contemporary, why not join a guided tour of local street art? With such a young population, it’s not surprising that Dunedin has quickly adopted a taste for this cool art movement. Downtown Dunedin also boasts some impressive architecture, and a walking tour is the perfect way to see some of the splendid neo-gothic public buildings. Olveston Mansion is a veritable time capsule of design, displaying beautiful Japanese and European art and craft dating from the 19th century. For a different sort of history, visit the Toitū Otago Settlers Museum to gain an insight into local Maori and settler culture. 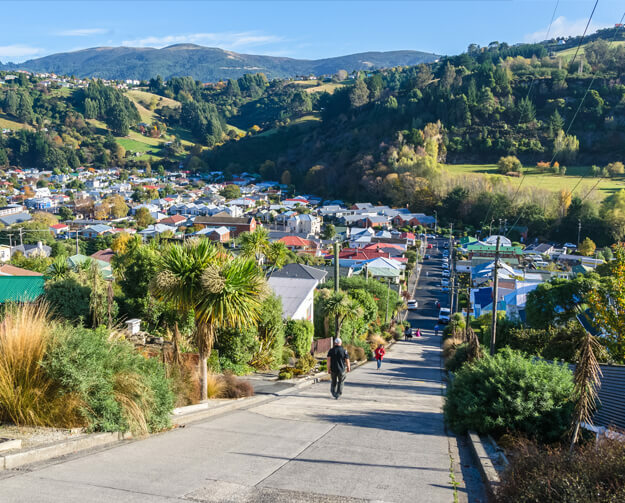 If you feel like getting out and about, head to Baldwin Street - holder of the Guinness World Record for the world’s steepest street, with a gradient of 19 degrees. If you time your visit for July, you can join in one of the more bizarre customs in this area - a Jaffa Chocolate Orange race down the street. Meanwhile, nature-lovers won’t want to miss the chance to go on a day trip to see the rare yellow-eyed penguin and the little blue penguin. Afterwards, head to St. Clair, which is a gorgeous beach well known for its surf, or visit Long Beach with its labyrinths of sandstone arches and caves. Fans of gastronomy are well-served in Dunedin. Go on a tour around the city’s two breweries, and accompany your beer tasting with some of the excellent cuisine of the region. Delicious meats and seafood abound in the many fine dining restaurants. For an authentic taste of the local food, browse the weekly farmers’ market to sample some of the more traditional Otago fare, including cheeses, cordials and breads from the region.